A glossary is a collaborative activity in which instructors and students can create a list of concepts and their definitions. Entry pages for concepts can contain formatted text, images, and attached files. Participants can provide comments and rate individual entries, turning the glossary into a graded assignment activity. PLEASE NOTE: Glossary entries are not backed up and restored when new courses are created each semester. To migrate a glossary to a new course, the glossary needs to be exported from the old course and then imported into the new course. PLEASE NOTE: There are two different ways to complete the next step depending on which view you are in. If you see two separate drop-down boxes, click Add an activity and select Glossary. For more information about this option, view Activity Chooser Options. 4. Select Glossary and click Add. 5. 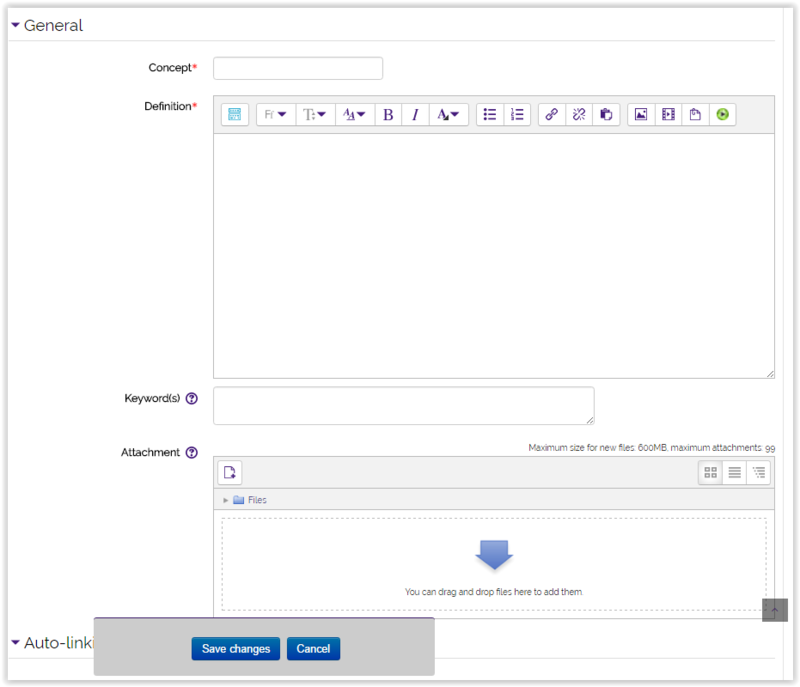 Assign a Name and Description to the glossary. There are also many optional settings including: Displaying description on course, Glossary type, and Entries shown per page. 6. Personalize the glossary in the Glossary Settings. Once you have selected optional settings, click Save and return to course. 1. Click the glossary link on the Moodle course page. 2. Click Add a new entry. 3. Enter a Concept Name and Definition. Optional settings include: Keywords and Attachment. 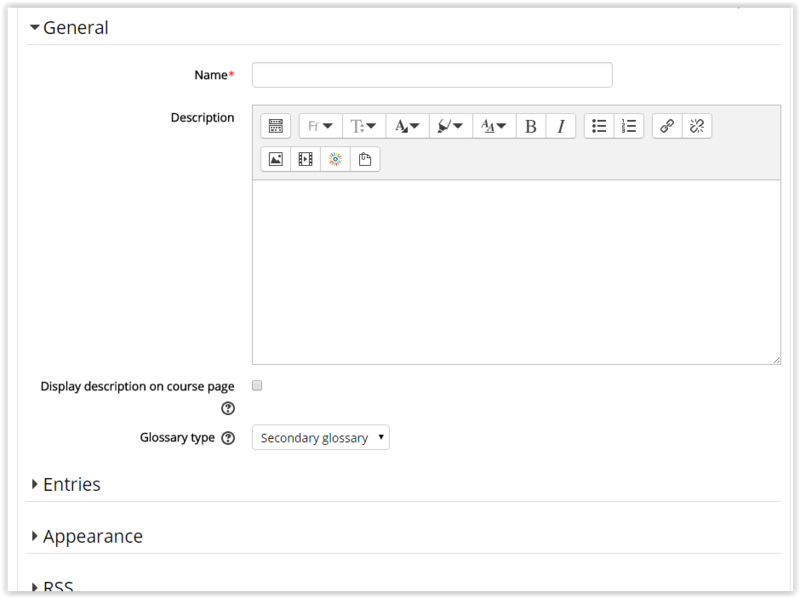 NOTE: By Auto-linking, words defined in the glossary can be accessed from anywhere in your Moodle course. 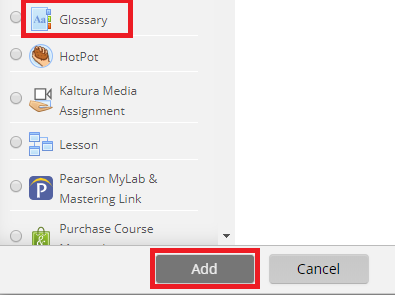 Whenever a glossary term appears in the course, it will automatically be converted into a hyperlink that will open the glossary to its definition page. 4. To turn Auto-linking on, click on the check-box next to the option called "This entry should be automatically linked." You may also select "This entry is case sensitive", and/or "Match whole words only" to apply settings.